Review of Upright Brewing Four | Beer Apprentice - Craft Beer News, Reviews, Interviews and Info. What’s up guys? I hope all is well on this fine day. Well, it’s time for another craft beer review and for today’s tasting I’m going to be trying the Upright Brewing Four produced by the Upright Brewing Company located in Portland, Oregon. I’ve yet to have anything from Upright, however I grabbed the Four, Five, Six and Seven, so I believe I’m going to have a great time finding out about them. From the website, uprightbrewing.com, we gather this bit of info about the Four. Four is a wheat beer embodying the spirit of country-style French & Belgian ales. It’s light but nuanced with floral and herbal aromas and flavors, capped by a dry and mildly tart finish. This beer came in a 25.4 oz. bottle and it had a 4.5% ABV. It poured a hazy, yellowish/orange color. It looked a whole lot like pineapple juice. A well sized, bright white head was formed from a medium aggressive pour. It was soapy, fluffy and rocky. The retention time was solid and the lacing was patchy and clingy. The nose presented some nice notes of lemongrass, freshly cut hay and some light pepper spice. A sturdy waft of yeast and bread along with a subdued musty funk. The bouquet also had a meager amount of a mineral type smell. Overall though, it was balanced fairly well and very manageable. The flavor let go of a light lemony citrus and some lightly tart green apple. The funk was subtle, yet the peppery spice was lively and proper. The yeast, grassiness and bread followed suite and really helped balanced and “round off” the flavor profile. Not bad. The mouthfeel was medium/thin bodied. Very light, airy, lively, crisp, refreshing and somewhat thirst quenching. The carbonation was spritzy and semi-stingy. It wasn’t quite as dry as I thought it might be, however it did leave a pretty good amount of flavor behind after each sip. Well, I thought this to be a nice beer. It was crazy easy to drink. I worked my way through this bottle in no time flat. It would be ideal for the upcoming Summer season that’s for sure. It’s not too complicated or overly robust, yet it still retains enough character to generate some conversation. I, personally, think that if I drink it again that I may just turn the bottle up and enjoy it for what it’s worth. I could definitely see myself having this after doing some yard work in the 90 degree heat. So, if you are looking for something besides the average Hefe or Pilsner this Summer…. pick up the Upright Brewing Company Four and give it a test drive. I doubt that you will be disappointed. 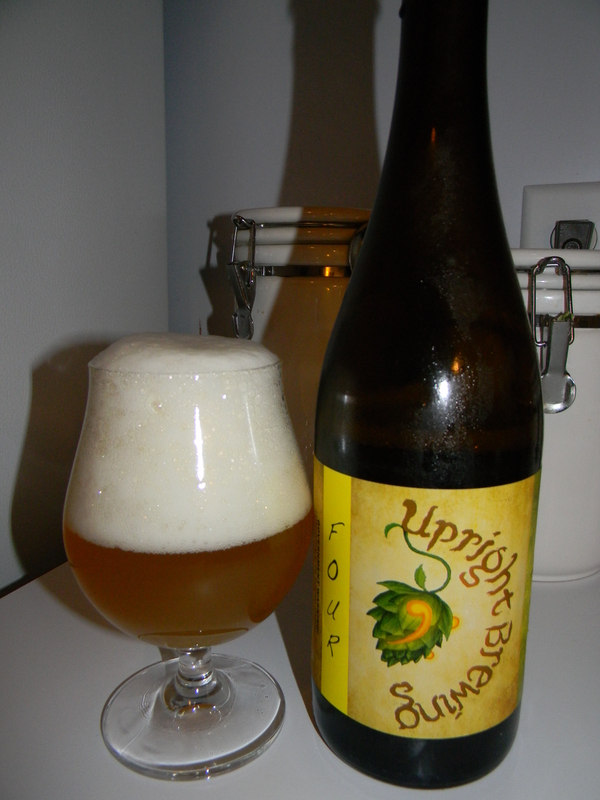 Posted by Beer Apprentice on May 1, 2013 in Country: USA, Upright Brewing Co.